The East Devon Way otherwise known as The Foxglove Way – follow the Foxglove sign. 38 miles of rambling through an Area of Outstanding Natural Beauty, and richly deserving the title. Wonderful shorter rambles can be made along its way. 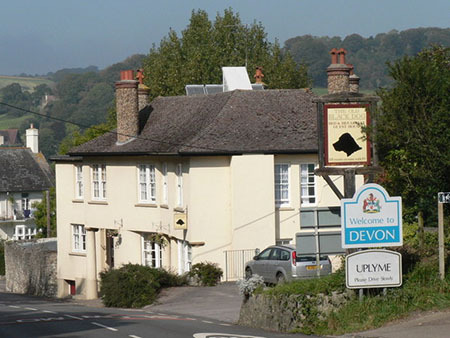 The East Devon Way runs from Exmouth to Uplyme close to the county boundary with Dorset. Some level walking, some steep hills and rolling countryside. 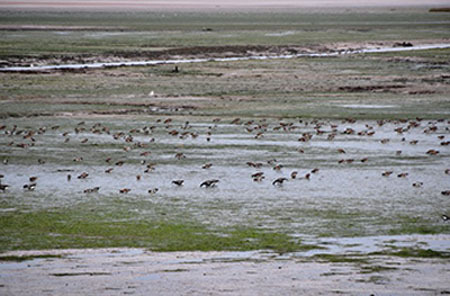 The trail starts off following the scenic Exe Estuary an important area in the winter for wildfowl and wading birds. Over 20,000 birds every winter, some may be rare. Such is the area's significance, naturally it is protected. There are actually two paths, the old one is a bit muddy and narrow, not suitable for wheelchairs at all. As it is close to the railway a very close eye should be kept on children and dogs. This walkway is quieter and does gives access to the river bed nearer to Lympstone. Really only for fitter folk. The new walkway is only recent and does have access for cycles and wheelchairs. It is safer for children and dogs. Lympstone is the first place on the trail. The attractive town became a borough in 1288, but there has been a settlement here since Roman times. The town was originally three Saxon manors - Levenston, now Lympstone, Nottesville now Nutwell and Sowden according to the Domesday Book. Nowadays they are Upper and Lower Lympstone and Sowden. 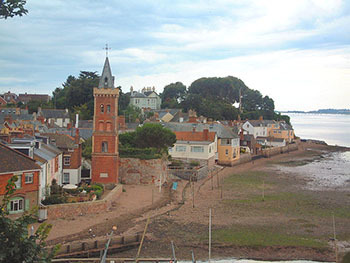 A mill in Lympstone, still working into the first third of the twentieth century, was also recorded in the Domesday Book. The striking red brick structure facing the estuary is Peter's Tower built by W H Peters in the 1880's in memory of his wife. Its clock was to have “Its face to the sea to tell fishermen the times of the tides” . There is a tradition that residents may dry washing on the foreshore. It could get caught by the flood tide! There are now metal floodgates to warn the residents living in the houses on the beach area when floods are predicted. Plenty of action has been seen in Lympstone over the centuries. Danish raiders invaded the area during Saxon times and inhabitants had to flee. A famous son of Lympstone, Ralph Lane, who was a soldier and equerry to Queen Elizabeth I, sailed with Sir Walter Raleigh to the New World. Here he founded a colony on Roanoke Island but there was much hardship and suffering and it did not succeed. Later Ralph Lane took part in the Armada – which did succeed. Pirates were very active on the seas around Lympstone during the 16th and 17th centuries, they were both English and foreign, the latter mainly Turkish and Algerian. Lucrative business of the times and it caused severe losses of life and West Country shipping as well as sailors sold into slavery into the countries of the pirates. Cliff Field, now owned by The National Trust, is thought to be the site of cannon owned by the Roundheads of the Civil War. The cannons were fired from the cliff to prevent supplies and reinforcements getting to Exeter which was a Royalist stronghold. Cannon balls have been found in the area. A footpath that starts behind the Swan Inn leads up to the Field. Wonderful wide views up there. From estuary to heathland the East Devon Way now turns inland ascending slowly to magnificent views over the estuary and the coast to the south. East Devon Commons is an area of heathland habitat and is home to two endangered species, the Dartford Warbler and the Nightjar. If you are lucky enough hear a rattling warble look for a small, dark, long tailed bird sitting on a grass stem or flitting among the bushes – it may well be the Dartford Warbler. The male has a dark red underside and the female is lighter. The Nightjar flies with long, graceful, deliberate wingbeats, at sundown. They spend their days on the ground, very quiet, and with their lichen coloured plumage are hard to see. Their call is that of a quiet churring, trilling sound. They could be on a fence or post or on a branch. The heathland is warmer and drier than the wild moorlands of Devon and is covered in gorse and heather. Woodbury Castle is an iron age fort. Built in timber to overlook the heath near Woodbury, and surveying Woodbury Salterton, the River Otter and right across the estuary to the hills beyond. Artefacts from 4th century have been found. A well chosen spot for a fort. There may have been an earlier fortification. It is now a wooded earthwork of red Devon soil and there is a notice giving details of the site. Woodbury Common is connected to the Prayer Book Rebellion and is the site of the second battle in 1549. The result of the battle did not stop the rebellion but there was a serious loss of life on both sides. 900 prisoners were taken by the Edward VI's army and they were massacred the next day at Clyst Heath not far away. The Prayer Book Rebellion was caused when the Protestant Book of Common Prayer was introduced during the English Reformation. It was not a popular move particularly among the Catholics of Devon and Cornwall. Another change of scenery as the East Devon Way moves through typical pleasant Devon farmland, and this time the general direction is downhill. The River Otter is crossed just before Newton Poppleford. The River although always thought of as a Devon river actually rises in The Blackdown Hills in Somerset. Named of course for the little animals that used to frequent it. The otters are slowly coming back. Newton Poppleford was a Saxon settlement and earlier a Roman one. Built and called a 'new town' by the Lord of the Manor of Aylesbeare, who was also granted a market charter in the 1200's. Poppleford may be the original name – a corruption of 'pebbly' or more probably 'people's ford'. Cob and thatch cottages going back several centuries, St Lukes Church wih its tower built in the 1300's, plus an old toll house dating from around 1758 speak of the history of the town. Growth in more recent years can be seen by the housing estates built around the town. Newton Poppleford is most famous for its King Alfred daffodils. The daffodil industry was once the biggest employer in the town and there are still daffodil nurseries. The King Alfred daffodil was first bred in the town at a local market garden. In spring there are wonderful displays of this lovely golden flower. 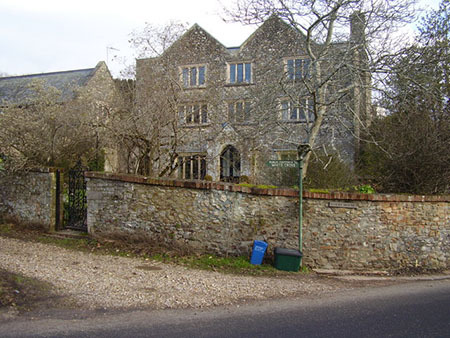 Newton Poppleford has a sister village close by, Harpford, originally another ford of the River Otter. The next 16 mile stretch of the East Devon Way contains two steep hills at Sidbury and Farway. From the Newton Poppleford area follow the foxglove signs out of the Otter Valley. Upwards and onwards to Fire Beacon Hill. What a view – out almost to Portland and the whole of Lyme Regis Bay on a clear day. Fire Beacon Hill is as the name would suggest one of the many beacons set up to warn of the landing of the Spanish in Elizabethan times. Fires would be lit on the hills, one beacon warning the next. With Francis Drake's defeat of the Armada they were not needed. Fire Beacon Hill is a Local Nature Reserve. It is said Hanging Judge Jeffreys stayed here. The East Devon Way now moves on into a parallel valley, that of the River Sid towards that view of Lyme Regis Bay. The River Sid is the smallest river in Devon, just over six miles long. It rises in Crowpits Covert and enters the sea at the lovely regency town of Sidmouth. As well as being a short river it has steep banks and remote areas ideal breeding grounds for otters, kingfishers and many other species. 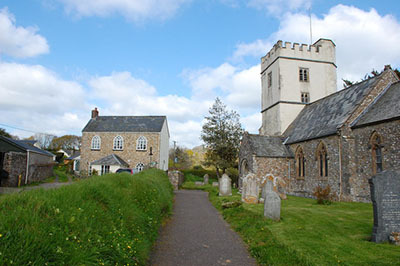 Sidbury is in the valley surrounding its church in a patchwork of Devon fields. The name comes from the iron age hill fort, Sidbury Castle, the largest earthwork in the district. That there is a hill fort means that there may well have been habitation since before the Roman conquest. Sidbury is mentioned in the Doomsday Book as the manor of Sideberia! A gunpowder storage room in the local church, St Peter and St Giles, dates from the Napoleonic Wars and was part of the precautions against an invasion at the time. The Church itself has a Norman tower, a Saxon crypt and a font that dates from the 1600's. There are signs of medieval work in one of the houses in the village and some houses date from the 1100's and Elizabethan times. A picturesque village that has moved on with the centuries. Rolling countryside along the East Devon Way takes the walk to Farway and a steep climb leads to Farway Hill which rises to 800 ft . Green country, beautiful wildflower meadows and sheep on the slopes. A small village with a Norman church set in an attractive quiet area. The most important Middle Bronze Age barrows in Devon lie atop the plateau, quite a large area of them. A relief from climbing, a steady descent takes the East Devon Way down to the serene River Coly via the pretty village of Northleigh set in a pastoral landscape. The church has an unusual white rendered tower which has the distinction of having pre reformation bells. Not quite four miles away to the south east through green countryside is Colyton where the rivers Axe and Coly meet nearby. Beautiful Colyton, an ancient town possibly dates to around to the eighth century and is named for its river. Its Church was originally a Saxon one, replaced by the distinctive Norman one with the lantern tower in the eleventh century. The bridge is 600 years old and a walk round the streets will yield several old buildings and some delightful small shops. 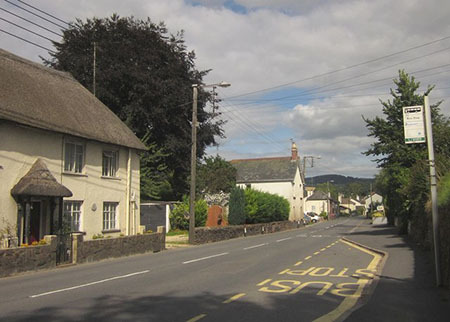 Colyton has quite a claim to fame – known as “Devon’s Most Rebellious Town” because in 1685 more men from Colyton than in any town in Devon went off to the Monmouth Rebellion. This rebellion was led by the Duke of Monmouth who was the Protestant illegitimate son of Charles II. He claimed to be the rightful heir to the throne and tried to oust James II. Another of the Stuart rebellions between Protestants and Catholics. Sometimes called the Pitchfork rebellion because large numbers of the troops were farmers and ordinary folk armed with farm tools such as pitchforks. 105 men were from Colyton. The final battle of the Rebellion was at Sedgemoor and these inexperienced fighters were beaten by superior force. Of 320 men who were sentenced to death at the Bloody Azzizes by Hanging Judge Jefferies, 14 were Colyton men. Of the 800 sentenced to be transported to the West Indies and sold as slaves during the same trials, 22 were also from Colyton. 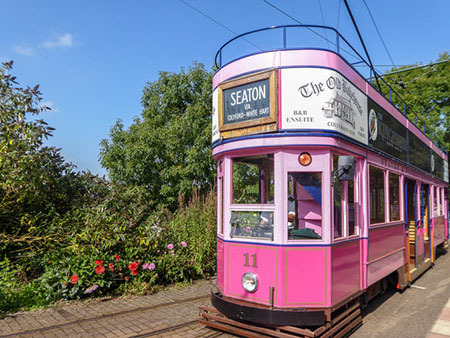 As an aside from the East Devon Way and a fun trip is the Seaton Tramway that starts at Colyton. It is narrow gauge, running heritage trams to Colyford and Seaton. It runs through beautiful countryside and alongside the Axe estuary where birdlife abounds. Well worth the trip – there and back perhaps, it is only three miles one way! A great time for a visit Colyford is at the end of September – Colyford is best known for its Goose Fair. An ancient tradition, it was revived in 1980. A colourful medieval procession, complete with the music of the time, starts the proceedings. Attention grabbing, ancient sports such as archery, falconry and a type of jousting, plus a comic Mummers play take place during the day. There is a motor museum in Colyford for a side trip at other times. It is on the main road and cannot be missed because of the cheerful pumps on the front. It was once a filling station. Back to the East Devon Way from Colyton – ramble following the Foxglove sign slightly north of easterly from near Colyford along the Coly Valley to the River Axe. This river is a 22 mile shallow stream that flows from where it rises in Dorset, past Axminster to Axmouth. From the look of the floodplains it might be the river could be prone to overflow at times. The Axe is crossed near the village of Musbury. Colyford to Musbury is around two and half miles. 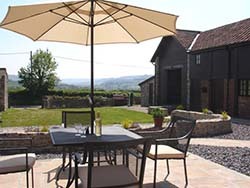 Musbury is the home of River Cottage HQ - the original River Cottage is in Dorset. Here Hugh Fearnley Whittingstall is restoring his second property at Park Farm, Trinity Hill. Besides running a stunning array of courses he is managing the property, running a local produce stall in Axminster. writing, doing television and a myriad other things!!! John Churchill, first Duke of Marlborough, 1650 – 1722, was born in Musbury. He was the son of Sir Winston Churchill, an impoverished cavalier, and Elizabeth who was born a Drake. The East Devon Way now moves south east towards Uplyme. Just outside Musbury a hill fort – 574 feet above sea level is a must side track for shutterbugs with both cameras and camcorders. The spectacular view is well worth the climb – right down the valley over fields and the river to Seaton and the English Channel on a good day. Not surprising it was the site of an iron age hill fort. Musbury Hill is the site of a distance race for both affiliated and unaffiliated runners, junior and senior in September every year. All in the name of charity. Pretty popular event. Back to the Foxglove trail the route now wanders its way over rolling countryside to Uplyme a picturesque village on the Dorset border. The borders of this village are surprisingly long – sixteen miles and makes it one of the largest parishes in England. The river is the Lym. A bronze mirror 2000 years old and a Roman villa have been found at Uplyme indicating that habitation in the area goes back a very long way. Two ghost stories haunt Uplyme - A mysterious black dog is said to frequent a narrow laneway by the pub known as the The Black Dog. It is supposed to be the “spirit of treasure” because of a tale that this dog haunted an old man’s house near Lyme Regis. At first the man did not worry about him, but one night he came home drunk and chased the dog with a stick. The stick hit the ceiling and with the plaster down came Stuart coins. The man built the pub that is called “The Black Dog. The other story is of a phantom coach and four horses seen on the old coaching road. Hanging Judge Jefferies tried the rebels of the Monmouth rebellion at Court Hall Farm. Are there any ghost stories about him or his victims? The two major structures in Uplyme are the lovely church and Cannington Viaduct. The Viaduct is 600 ft long and was opened in 1903 for the line from Axminster to Lyme Regis. It was the first viaduct in UK to be constructed entirely of concrete. Makes a pretty good photo opportunity. The East Devon Way with its Foxglove signs ends at Uplyme. There are good paths on to Lyme Regis. The East Devon Way is nearly 40 miles long. Why not walk it as a short break staying enroute.